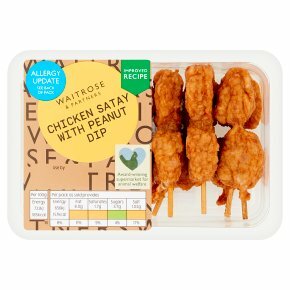 Chicken Satay on wooden skewers, with a fragrant mix of ginger & Cayenne Pepper. Packed with a delicious peanut dip. INGREDIENTS: chicken breast (29%), chicken thigh (29%), water, peanuts (8%), sugar, wheat flour, mustard flour, sunflower oil, rapeseed oil, acidity regulator (potassium lactate), spirit vinegar, salt, yeast extract, stabiliser (potassium phosphates and sodium phosphates), chillies, lemongrass, garlic, garlic powder, ginger, emulsifier (mono- and diglycerides of fatty acids), cayenne pepper, onion, green cabbage, thickener (guar gum), soya beans, wheat, ginger powder, mushroom, pepper, yeast, ginger extract.